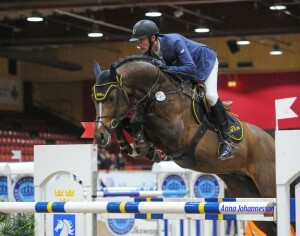 Swedish Warmblood SWB | Horses on Request from elite european mare families, offered for sale by Katri Wayrynen, Flyinge. New Port-W 1314 a stallion approved for breeding by the Polish Half- breed, wlkp, FWB and SWB. Newton, 3yr old stallion by New Port-W 1314 at SSHS auktion, sold for 360 000 SEK. New Port-W is free from WFFS-gene. New Port-W and Elmo Jankari (FIN)became second in the Finnish ranking 2017 thanks to several international prizes. See New Port-W in stallion approvals at Youtube. CIC3* crosscountry at Strzegom October festival 2017.